To automate the document generation in salesforce, we have two well known AppEchange products named “Conga Composer” and “LOOPlus from DrawLoop“. Both products are well used in industry and both have advantages and disadvantages over the need and situation. 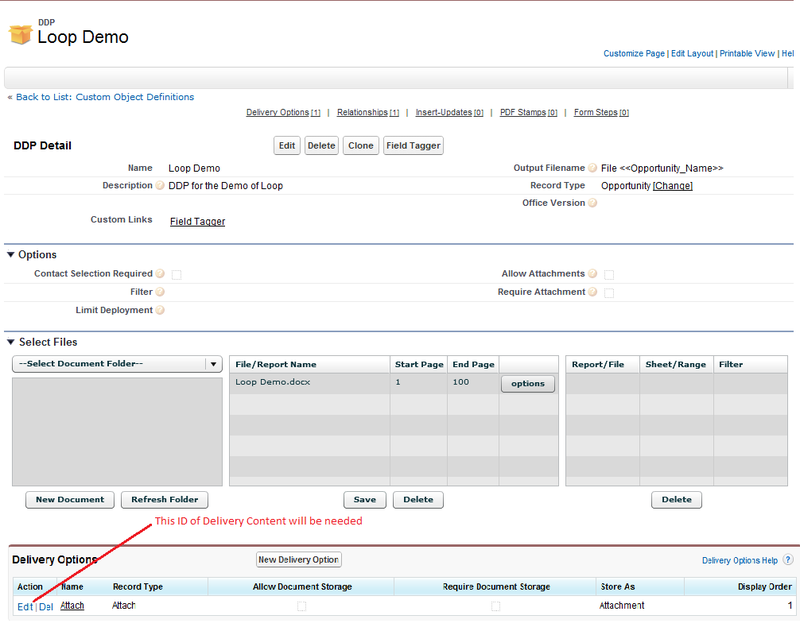 This article depicts automating the document generation using Apex in LOOPlus. As i have been through this situation and didn’t find any resource on web to automate the document generation using Apex, so i thought to put this article. The one advantage which i know is that using LOOPlus you can combine all the attachments into single one which is not possible in Conga Composer. Navigate to this URL to install the trial version of Drawloop (LOOPlus) from AppExchange. To use the Drawloop API we need to use the “Business” version of LOOPlus. To activate this, navigate to “LOOP” app and then “DDP Admin”. Click on button “Modify Subscription services“. New Page will open, select “Business” in LOOPlus level as shown in below image. 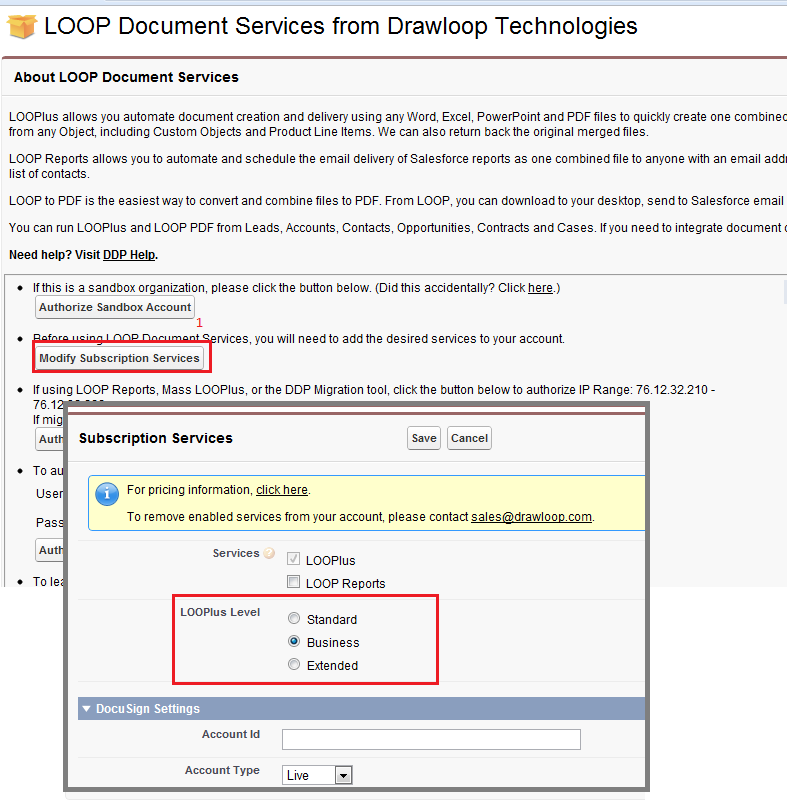 After this step, email “loopsupport@drawloop.com” to enable Outbound Messaging for your organization, only after that you can use the Apex for LOOPlus. For this article, i hope that you already know how to generate the DDP using DDP wizard. I am going to add one button in List View of “Opportunity” and when i will select the opportunities, and click on that button Visualforce Page will invoke resulting in execution of DDP from Apex. //Below ID is of main "DDP"
Note : Only 10 records can be selected at a time because it calls the webservice of loop to generate the document and as per Salesforce limit we can have only 10 callout per transaction. Great post! We do have new methods for calling DDPs within Apex. Please contact us to learn more or check our support site for documentation when it becomes available. Nice post! I am new to salesforce apex and I tried this solution but I am executing this class from developer console anonymously. My question is where do I see the converted file? Thanks Jitendra. Do I need to do anything else besides you have mentioned in article? I mean is there any other steps needed? I have choose delivery options as attachment but I don’t see any attachment in opportunity object. I am just doing it for one opportunity and triggering this piece of code from developer console. Please help me with this. I am also facing this same issue now. do you have correct code for this now? I have tried this logic in trigger and getting this same error. Have you resolved this issue? can you please share solution for this?